Baie-du-Cap is a small village located along the south coastal region of Mauritius. The southern coast of Mauritius is known for its natural beauty because of which you will be tempted to go for a drive around the coast from Mahebourg down to Baie du Cap. This region, stretching itself from Mahebourg to Le Morne, from one point to the other, is exceptional. From small coastal villages to the township, the coast is wild and the open sea is never sea off. Approximate distance in miles from Baie Du Cap Mauritius to Mahebourg Mauritius is 22 miles. After the sandy beaches of Blue Bay, Le Chaland and La Cambuse, the coast becomes more and more wild and rocky and the climate more and more breezy. Rain is very frequent in this part of the island and so are the cascading waters that travel down the picturesque landscape, forming canyons by deeply cutting into the soft soil where hiking, canoeing and other nature activities thrive. In this area there are various attractions like Crocodile Park located around Rivière des Anguilles and a tea plantation in Souillac. Baie Du Cap also has a couple of low-key monuments, the Trevassa Monument and Matthew Flinders monument. 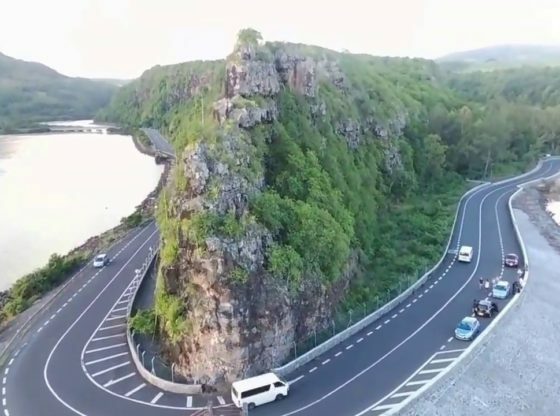 Between Le Morne and Baie du Cap, a very beautiful hairpin curve is located called as Macondé which you need to cross if you are driving along the coastal road in the south of Mauritius. It is worthwhile to stop the car behind the curve and climb up the rock for a breathtaking view. The peak of the rock ends in the Indian Ocean. Towards the west you can visit Chamarel, the colored earth. Another attraction nearby is Ilôt Sancho located between Bel Ombre and St. Felix. The island is walking distance from the beach of the Riviere des Gallet and can be reached by crossing a very shallow sea. Nature and bird lovers can visit Domaine de Bel Ombre, a nature reserve set on the old sugar plantation. You can enjoy beautiful waterfall, watch very pretty birds & enjoy lush green vegetation around. Baie du Cap lagoon is also a popular site for kite surfing in the country due to the wind direction and flat surface. There are no accommodations facilities directly in Baie du Cap but there are some good options nearby at Le Morne. Villa Alamanda is situated in a lovely setting, at the foot of Le Morne Mountain. There are a few cheap and good restaurants besides the junction in Baie du Cap village. Chand Snack is a good eating joint and offers a wide choice of Mauritian food. There is not much of development along the south coast of Mauritius, but it is abundant in natural beauty and worth a visit.